One of Metro Transit’s new advanced “super hybrid” buses—built in Minnesota and billed as the cleanest, most efficient diesel-electric hybrid buses in the United States—garnered national attention at the American Public Transportation Association’s Bus and Paratransit Conference May 5–8 in Indianapolis. Unique because of its all-electric accessory systems, the bus was featured at the event so that transit professionals from across the country could experience this new hybrid technology firsthand, says Chuck Wurzinger, assistant director of bus maintenance at Metro Transit. 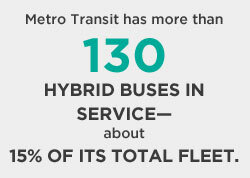 The bus is one of two advanced hybrids built for Metro Transit in 2012. They currently operate on local routes with frequent stops in downtown Minneapolis and its surrounding communities. 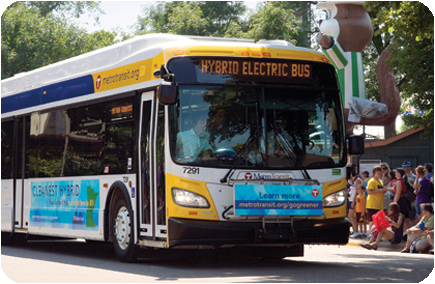 The decision to purchase the new hybrids was greatly influenced by the results of a University of Minnesota study aimed at improving fuel economy in diesel-electric hybrid buses, Wurzinger says. The “Superbus” study, led by mechanical engineering (ME) professor David Kittelson, included an energy audit of major accessory systems on a standard hybrid bus. The study was funded by Metro Transit, CTS, and the U of M’s Institute for Renewable Energy and the Environment (IREE). Study findings indicated that up to half of the fuel consumed by hybrid buses is used to power accessory systems. According to the research team, powering these systems electrically could significantly improve fuel efficiency. The new advanced hybrids do just that, using all-electric systems to power the heating, air conditioning, engine fans, power steering, and air compressor. These components improve fuel economy, reduce emissions, and allow the buses to be operated in electric-only mode for short periods. One of the buses also has start/stop capabilities, which allow the engine to shut down at bus stops and traffic lights. “This reduces engine idle time while maintaining all other bus functions, including passenger comfort and safety features,” Wurzinger says. 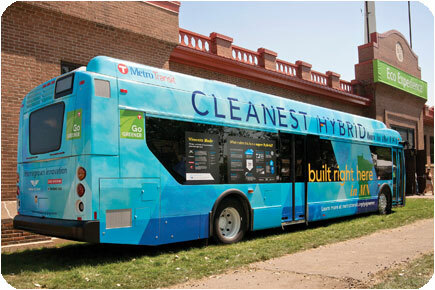 Along with a standard hybrid bus and a conventional diesel transit bus, one of the advanced hybrids will be monitored and evaluated in a new study conducted by U of M researchers in collaboration with Metro Transit. The multidisciplinary research team includes Kittelson, ME associate professor Will Northrop, ME research associate Winthrop Watts, and applied economics associate professor Steven Taff. As part of the study, funded by IREE, the team will collect real-world, on-the-road data from the three buses in all seasons on a variety of route types. The researchers then plan to compare the efficiency and emissions of the buses and make recommendations to Metro Transit about which configuration is the best for a given application. Data collected from the study will also allow Metro Transit to work with bus manufacturers to optimize bus performance. “We believe the results will be useful in writing bus technical specifications and also in determining if a certain type of bus is best suited to a certain type of bus route,” Wurzinger says. Ultimately, this information could be used to determine which buses to assign to which routes as well as which type of bus to purchase given fleet replacement or expansion requirements. Reprinted from the CTS Catalyst, June 2013.